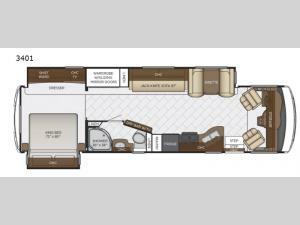 Let this Bay Star 3401 motor home by Newmar take you on your next trip in style! With a full wall slide out there is plenty of space inside this motor home, plus you will enjoy the extra storage space with the large wardrobe! In the living area there is an 87" jack knife sofa and across the room you will find a dry bar with a TV. After a full day of adventure then you will want to retreat to the rear bedroom and get a good night's rest on the king bed!